Home DOG NEWS What’s the Best Raw Dog Food for Your Pet? A diet of raw dog food is created to mimic what a dog would have eaten in its natural habitat. The idea is based on their carnivore predisposition. Many have an inherent desire to stalk, find, capture, and eat another animal. It’s their true prey drive. This type of raw pet diet is not for every canine household. However, it is completely natural for the dogs as their ancestors, the wolves, ate the entire animal. Meat, bones, organs, and all. This means that since dogs are direct descendants wolves, they enjoy this diet. We have to acknowledge that they are simply not genetically able to healthily process the 50% carbohydrate of today’s kibble. Kibble is easier to prepare and serve than feeding your dog pet food that is raw but is nowhere close to what a dog’s ancestral diet was. What Does the Raw Dog Food Diet Consist of? When looking at this raw product, you will find it comes in various forms. You can have a meal boost topper that is sprinkled on top of your pet’s regular meal to help with those picky eaters or give a protein boost. You can serve patties which you crumble into your dog’s dish or actual nibs that look similar to dry food yet are raw. All products are made with farm-fresh raised beef, organs, and bones. It is grain free, gluten free and packed with protein and amino acids. This product has no artificial ingredients, no added hormones, antibiotics, fillers or flavorings. It is a meal that is ready to go at any time with no preparation needed. A great well-balanced meal for your pup. This product is freeze-dried to retain the freshness of the raw meal. It has multiple recipes in the raw form for your pet. It can be served as an added part to your pup’s regular kibble or on its own as a full meal. Its ultra-rich protein and balanced fat recipe of salmon and turkey product has 83% salmon, turkey, organs, and bones with strawberries and then includes the other 17% of ingredients as wholesome vegetables and fruits, such as pumpkin, blueberries, kale, and spinach. It also has GanedenBC30, a great probiotic, that benefits your dog’s digestive and immune health This product is minimally-processed and quickly frozen to lock in the nutrients of the ingredients. It has no corn, wheat, soy, or artificial preservatives (colors or flavorings). It has all the good things of raw food without the hassle of preparing it. This raw food product line and different recipes to entice your pet. It is made from fresh ingredients that are freeze-dried to lock in their smells, flavors, and nutritional values. It has a single source protein combined with fruits and vegetables loaded with nutrients for your pup. It is grain and gluten-free and has the optimal levels of essential fatty acids, vitamins, minerals, enzymes, and antioxidants to support their health and well-being. The flaxseed and salmon oil offer omega fatty acids to keep their coat and skin healthy. It’s a product that will meet your dog’s desire for a raw diet and keep him healthy and active as he ages. The raw food diet for your dog is one that can have great benefits. Whether the food you choose to feed him is raw or freeze-dried, your pup will get all the benefits. Freeze dried is still considered raw. As with every diet change, talk to your dog’s veterinarian to make sure it will be beneficial for your dog. If you are given the go-ahead, then start your research and pick a brand and flavor that your dog enjoys. Check back in with your veterinarian every so often to make sure your dog is maintaining their weight and all the nutritional needs are being met. 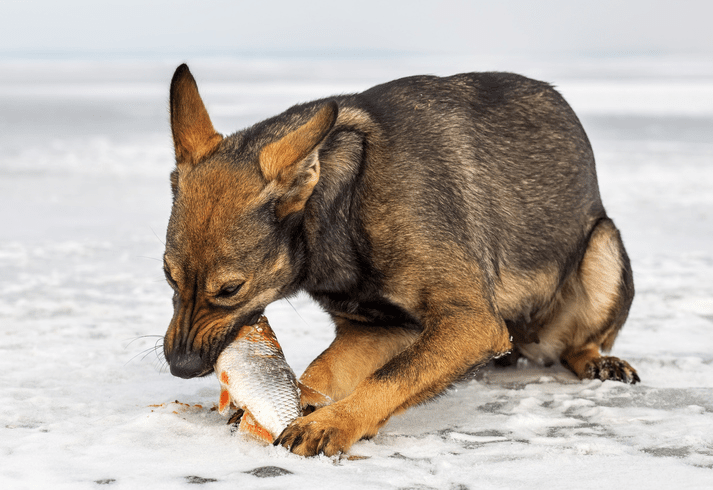 This diet is a little trickier than others so it’s best to monitor your pup a little closer to make sure he is getting everything he needs nutritionally. Next articleWhat’s the Best Dog Food if Your Pup Needs to Lose Weight?